Not sure if I’ve mentioned, but I’m a big advocate of the traditional Sunday Roast. Having sampled the delights (and frights!) at some of the city’s finest food emporiums, it was time to pull out all the stops and head to Six at the BALTIC Centre for Contemporary Arts. Since being taken over by Fresh Element (headed up by award-winning chef Richard Sim) in 2009, the restaurant has managed to shake off its somewhat pretentious and stuffy reputation to emerge at the forefront of our regions’ local treasures, with a menu that’s accessible to all and with prices that reflect this positive change. 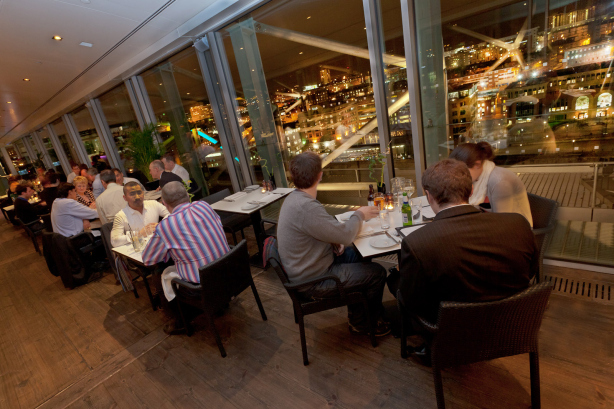 A trip up the glass elevators takes you to the gloriously light and spacious restaurant, with spectacular views of both Newcastle and Gateshead quays and a relaxed yet buzzing atmosphere that envelopes you as soon as you arrive. We were greeted instantly and shown to an impressive lounge to peruse the menu and order a drink while our table was prepared. We chose a light and delicious bottle of Prosecco NV (Vetriano, Italy) at £25.00 as it was a semi-special occasion but there’s a multitude of wines and beers to suit all tastes and budgets. Staff are knowledgeable and attentive yet unobtrusive, happy to make suggestions to help customers make an informed decision. Our waitress was totally comfortable in guiding us through the extensive wine list. The decor compliments the notion of endless space; with floor to ceiling glass windows, a well-stocked and accessible bar area, large white tables juxtaposed with black chairs and plenty of fresh flower arrangements. The music is easy-listening, a mixture of electronica and down-tempo jazz, set at just the right volume so that conversation takes precedence. It’s impeccably clean and organised, the table linen and cutlery are clearly of excellent quality and it all this wasn’t enough, it’s surrounded by one of the best views in the North. 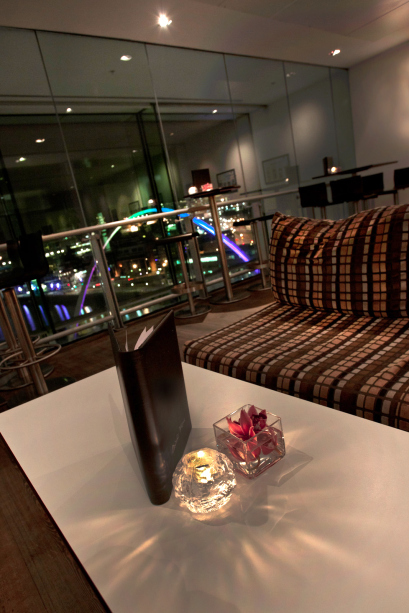 Six is one extremely stylish crow’s nest over the Tyne. 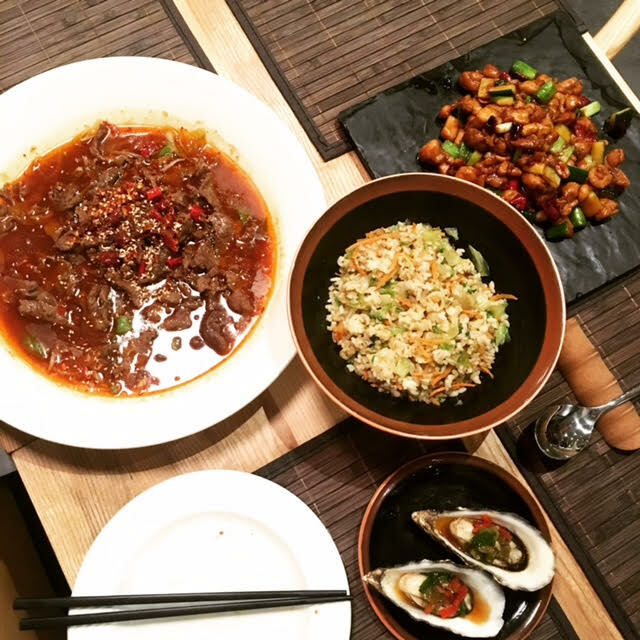 The Sunday menu is simple and luxurious in equal measure. Starters are a very reasonable £4, with dishes ranging from the fail-safe Soup of the Day (Jerusalem Artichoke, which was unfortunately sold out), Pigeon Breast, Smoked Trout, a Mussel and Chorizo Chowder and Smoked Mackerel Pâté. I opted for the trout which was served with a vibrant beetroot purée and toasted brioche with a sprinkling of fresh rocket. The trout was beautifully fresh and uncomplicated, enhanced further by the other subtle elements of the dish, and the portion size was perfect for kicking off my culinary experience. The other members of my party went for the Pigeon Breast and the Smoked Mackerel Pâté which was served with croutons and beetroot chutney – again, both dishes perfectly sized, beautifully presented and well received by my companions. 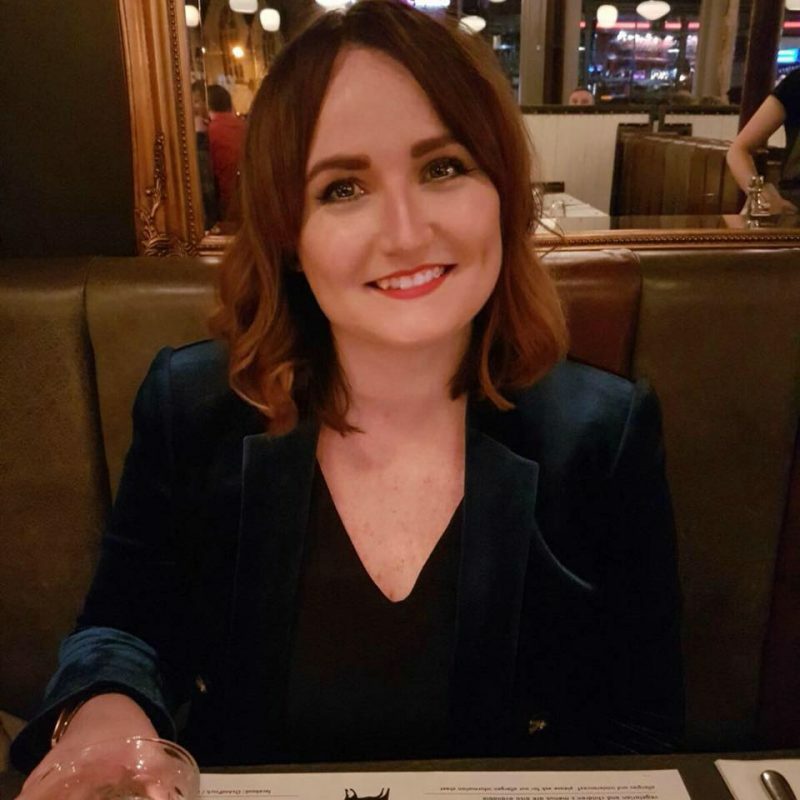 The main course menu is bold and laden with tempting options; I couldn’t resist the Wallington Estate Roast Beef (all main courses are £12.00 however the beef has a £2.50 supplement added – totally worth it!) The meat is served slightly pink, with hands-down the best roast potatoes I’ve tasted in a long time, a large and fluffy Yorkshire pudding, mashed potato and a selection of seasonal veg including broccoli, cauliflower, mangetout and cabbage. The gravy is more of a jus really; quite thin in consistency but bursting with flavour and not a lump in sight! As always, I asked for extra. The portion seemed to be much more than my £14.50 worth and as much as I struggled, I was determined to consume every last delicious bite. Be warned though: you may panic and think you have no room left for dessert after a Six roast. I also got to pinch a bit of lamb from another plate on my table and can confirm it is equally as impressive as the roast beef. There were definite hints of rosemary and the meat was tender and juicy, accompanied by a home-made mint sauce and all the other standard Sunday Roast trimmings. The menu also offers roast loin of pork, chestnut-crusted pheasant and duck egg with black truffle, potato and thyme rosti and wild mushroom ragout for the vegetarians out there. As I’ve mentioned in previous posts, dessert isn’t really my “thing” and I could have quite happily had two starters instead, however on this occasion I took the plunge despite the fact the seams on my clothes were about to burst and I was slipping ever so slightly into a proper food coma. I ordered the blackcurrant sorbet and it was divine; very refreshing, zesty and a light option in comparison to the rest of what’s on offer. I also got to sample the Coffee & Hickory Cheesecake which is any dessert-lover’s dream, lots of cream and richness with plenty of flavour: in short, totally indulgent! All of the desserts on the menu are priced at £4.00 which is startlingly reasonable and keeps things simple. The portions are a bit on the large side but maybe that’s just me, given that I’m not usually a dessert-eater and I was already fit to explode even before taking on my sorbet. I wish I had taken photographs of the dishes because everything that was put before me was presented so beautifully, but maybe you should treat yourself this New Year and try Six out for yourself? It’s an outstanding restaurant on so many levels: exceptional food, a pleasant ambience and lovely staff who are great ambassadors for Fresh Element. The menus are seasonal so change every couple of months, so to me that’s as good an excuse as any to make frequent trips in the future and try all of their delicious offerings. 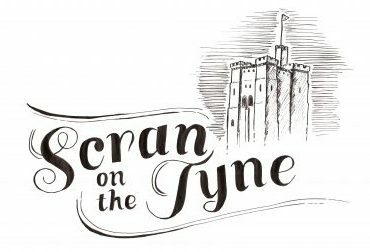 You can access the menus and see other reviews on the Six website (see links below) as well as special offers, vouchers and an online booking system. I must recommend that you book before going there, particularly for Sunday lunch, as I imagine it’s not the sort of restaurant you can take a chance on there being tables available and rightly so: Six is a serious treat! Check out the website here: www.sixbaltic.com and call (0191) 440 4948 to book.